gencar 1 year, 3 months ago. Here comes the Lineage OS 14.1 for Xperia Z3 Compact (z3c) via an unofficial build. If you want the OFFICIAL update or some more Lineage ROMs then stay tuned to the Lineage OS 14.1 Devices list page. This Xperia Z3 Compact Lineage OS 14.1 (z3c) is brought to you by mcgi5sr2, another build is brought to you by nailyk and one of the TWRP for Xperia Z3 Compact is brought to you by derf elot. No donation links available for any of the developers. THIS IS AN INITIAL BUILD WHICH MAY NOT BOOT AT ALL OR EVEN IF IT BOOTS IT MAY HAVE MANY BUGS. HAVE A BACKUP OF THE CURRENT ROM BEFORE FLASHING THIS ROM AND TRY AT YOUR OWN RISK. Installing a custom ROM on a Xperia Z3 Compact (z3c) requires the bootloader to be unlocked on the Xperia Z3 Compact (z3c) phone, which may VOID your warranty and may delete all your data. Before proceeding further you may consider backup all data on the phone. You are the only person doing changes to your phone and I cannot be held responsible for the mistakes done by you. Download and Copy the GApps and Lineage OS 14.1 for Xperia Z3 Compact ROM ZIP to your phone. First flash the Xperia Z3 Compact Lineage OS 14.1 ROM ZIP from device. Then flash the GApps zip from your device memory. Reboot and Enjoy the Nougat 7.1 Lineage OS 14.1 ROM for Xperia Z3 Compact (z3c). 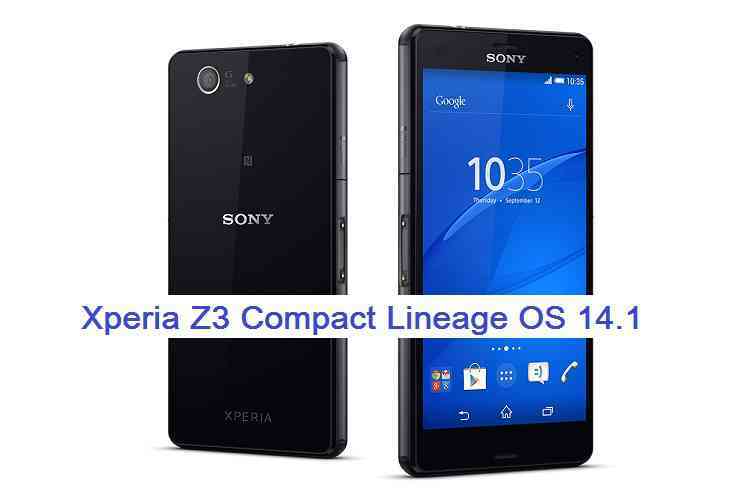 Copy the latest Lineage OS 14.1 for Xperia Z3 Compact ROM ZIP file to your phone. Stay tuned or Subscribe to the Xperia Z3 Compact (z3c) forum For other Android Nougat ROMs, Lineage OS 14.1 ROMs, other ROMs and all other device specific topics. I did everything like the tutorial, but when i try to reboot on recovery mode, it shows an Android lying down with a red triangle right above it, like i don’t have any kind of TWRP on the Phone, is it possible that my z3c is not compatible with the twrp? Hi @fernando_bravi_trombini, to conclude if the TWRP compatibility is a problem, you have to tell me which TWRP are you using on your phone. I will recommend you to use nailyk’s TWRP and Lineage OS 14.1 ROM for the Z3C. So I unzipped the ROM, removed the line starting with “asert” and packed it again, worked after that. Just a last question: as this is a kind of nightly build the auto update does not work, right? When I try to initiate a Lineage OS Update manually an error pops up that there was trouble finding the update, check internet connection. @mrdobiwe-de This is an unofficial Lineage OS build from individual developer(s) and not yet an OFFICIAL NIGHTLY Lineage OS, So, you won’t get any OTA updates on this Lineage OS ROM. You need to manually download and upgrade the latest Lineage OS build if available. Need to unlock the bootloader? My phone is z3c it is running with root. I have twrp installed, but I have not unlocked bootloader … can I install nougat? Will work? If you already have a TWRP installed then I think you don’t need to unlock the bootloader. You can just flash the Lineage OS ROM using the existing TWRP. Yesterday I’ve installed it. It works perfectly except the calls. Idk why but my microphone is not working during calls. Camera, recording,whats app in everything mic is working. Any solutions? I tried to upgrade to the new OS LineageOS 14.1 on the Sony Xperia Z3C with preinstalled TWRP from another source (TWRP 3.0.2-0) and with root. I have a locked bootloader. I met when installing with a phone versioning issue. My is the D8503 above. TWRP reports a Z3 model error. And it all ends. Do you advise me what to do or wait for a new version from Nailyk where will this be fixed? When you install a ROM from TWRP it checks the model number the TWRP is built with and not the model number shown on Android OS. I will recommend you to install a TWRP built by nailyk and retry flashing the same ROM and see if you go through!! This not a ROM issue and hence this may never be fixed in the upcoming versions. Otherwise you can modify the updater-script in the ROM zip file and install it forcibly.